Exercise Classes are offered throughout the year. These classes have included Low Impact Aerobics, Step Aerobics, Body Conditioning, Stretch and Tone, Water Exercise, Boxing Aerobics, Martial Arts, Yoga, Tai Chi and Power Walking. The Movement Studio, where most of the classes take place, features a wood-sprung aerobic floor. Classes are conducted by Nationally Certified Aerobic Instructors. In an continuing effort to maintain a variety of programs consistent with the fitness interests of the Las Campanas membership, some programs may be modified or deleted and new ones added. 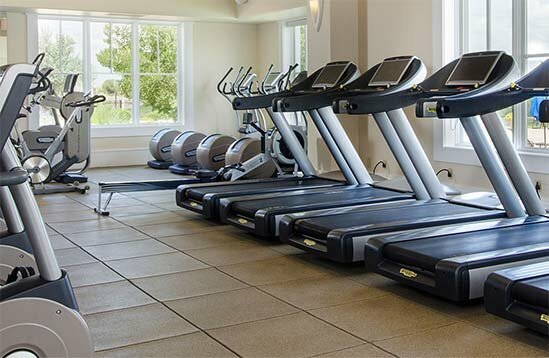 Overall Body Conditioning is supported by an array of treadmills, stationary bikes and stair steppers. Workout equipment includes Cybex and Bodymaster weight machines as well as free weights from 5-100 pounds. Personal training sessions and fitness assessments, including Flexibility and Body Fat Testing, by Nationally Certified Trainers are available.